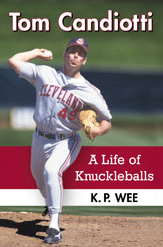 « Why is the knuckleball such an important style of pitching in the game of baseball? This entry was posted on September 8, 2014, 1:42 am and is filed under (Baseball) Life Ain't Fair..., Baseball. You can follow any responses to this entry through RSS 2.0. You can leave a response, or trackback from your own site.